Happy autumn – yes, it’s finally here! I'm still pretty tired from the Common Ground Fair, but with the little bit of mental energy I have, I've thought about what I saw those three days, and considered what it meant. I spent the vast majority of my time in and around the Fedco tent, adjacent to the Hayloft (workshop space) where I saw many different speakers and audiences come and go. There was a respectable turnout for every workshop, but there were two that drew a much larger crowd – with all the chairs occupied and with more people standing on all sides, trying to fit in the tent and participate while tuning out the din of the Fair. The two workshops were: "Work Songs" (led by Bennett Konesni & Edith Gawler), and "Apple Tasting - Vote for Your Favorites!" (led by our own John Bunker, with help from some of the OOAL crew.) Both of these workshops have become perennial favorites at the Fair; you can count on people flocking to them. I think this says a lot about what people want most at the Fair, and in life. We want camaraderie & community, beauty, adventure, and sweetness. We want an antidote to monotony. We want variation to spice things up a bit, to keep things fresh and interesting. And we want to enjoy life alongside our friends. I'm sure you can relate. As a toast to variety being the spice of life, there are 8(!) varieties of apples in the share this week. You might want to come up with your own work song to help get you through all the varieties. What’s with all the squirrels this year? 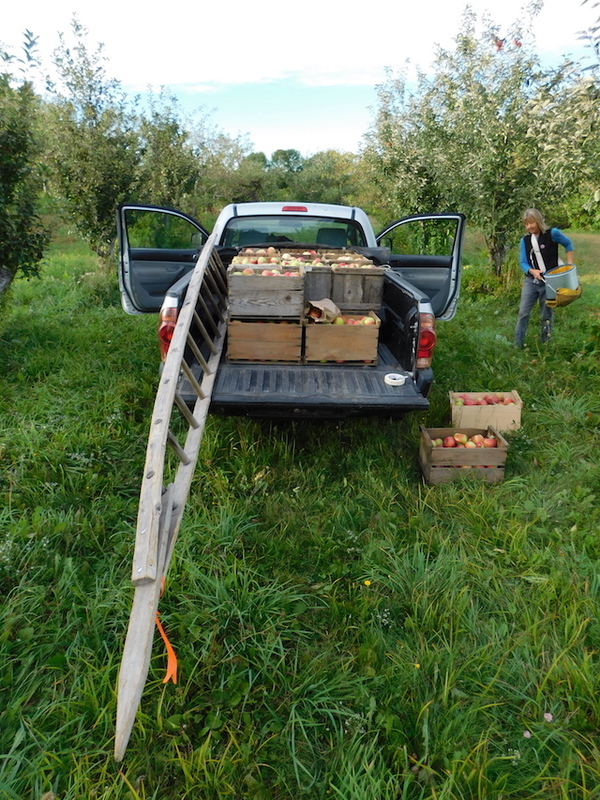 They are everywhere – suburban yards, our barn, city streets, the woods, the garden and the orchards. In a five-mile stretch of I-295 last week I counted over 20 dead on the side of the road. We’ve never seen such an invasion before. Perhaps the squirrel swarm is Maine’s version of the locust clouds that devastate crops in the plains states. Some claim it was the robust acorn production last year that is responsible for the population explosion, but this year those furry pests have expanded their diet preferences beyond acorns to include apples and pears. And they do not limit themselves to gnawing drops – oh no, they seek out the gems still clinging to the tree! Too often this fall we have stretched up high on the ladder to pick the biggest, rosiest apple at the top of the canopy only to feel our fingers sink into a bite mark hidden on the other side of the fruit. So guard your apples or you may just find a gray, furry tail sticking out of your bags! Which brings up what, besides squirrels, you will find in your share this week. As always, we have tried to provide you with a mixture of sizes, shapes, colors, histories and culinary uses. With the exception of Prima and Burgundy, two modern dessert fruit, all the varieties originated from chance seedlings noticed by an apple lover for some exceptional quality well over 100 years ago. The first person who bit into a Canadian Strawberry probably knew it was a winner for its striking flavor. Likewise for the Martha Crab. Taste them fresh and see what you think. The remaining four are old favorites that do dual duty as both cooking apple and dessert (fresh eating) fruit. If you like a tart apple, Fameuse might be your choice for fresh eating. It has a zing but won’t make your eyes cross like a Granny Smith. Summer Rambo, which is known for making excellent early pies before it is fully ripe, may be a bit past its pie prime now and ready for pairing with a piece of cheese. That leaves Wealthy and Smokehouse as the obvious choices for pies and tarts this week. However, if you are too busy to cook, they make good fresh eating as well. And if the squirrels are knocking at your door, you can always turn these apples into sauce. We haven’t heard that squirrels have developed a passion for that yet. September 25; 6 PM: South Solon meeting house, Solon, ME. September 27; 5 PM: Langlais Sculpture Preserve: 576 River Road, Cushing, ME. “Saving Our Apple Heritage.” For more information, click here. I planted fall fennel just so I could make this dish from Joshua McFadden’s cookbook, Six Seasons. When I went out to harvest the bulbs, I discovered that the storage beets had put on so much foliage, they had overwhelmed the fennel interspersed in the row. I was initially disappointed when I saw the spindly fennel plants, but it turned out to be a happy discovery. Those tender little bulbs cooked up quickly and became melt-in-your-mouth soft and delicious when I cooked them. And they were a similar size to the apple slices so there was no need for a knife. The only down side was that I used up all the fennel to make one dish. It was so good that I may have to go buy some more. Prepare the fennel – trim the roots and stalks, and slice the bulbs lengthwise into thin strips. Heat the oil in a skillet over medium-low heat. Add the smashed garlic, and cook slowly until the garlic is soft and lightly browned – about 5 minutes. If using chile flakes, add them here and toast for another few seconds. Next add the fennel slices and 1/3 cup water to the pan and cover. Check the fennel every few minutes. It should be simmering. If the water evaporates before the fennel is tender, add more. Continue cooking until the fennel is about ¾ cooked through - about 10 minutes. When is it tender, before it is mushy, turn off the heat and stir in the apples, toasted almonds, thyme, salt and pepper and half of the cheese. Scrape the fennel and apples into a 2-quart baking dish, top with the breadcrumbs and remaining cheese. Dot with butter (although I didn’t think it was necessary). Bake until the ingredients are hot and the cheese is starting to bubble – 30-35 minutes. To brown the top, place under the broiler for the last few minutes before serving. So I confess that once again I didn’t follow the directions. In case you want to, Joshua McFadden recommends that you add ½ pound of fennel sausage to the dish. Remove the casings as needed, and crumble the meat into a skillet over medium-high heat with a teaspoon of olive oil. Once it has lost its pink color – about 5 minutes – remove it from the skillet, and set aside. Use the skillet to cook the garlic and fennel slices. Return the sausage to the fennel with the apple and almonds. The recipe also calls for Taleggio cheese. I know it’s hard to believe, but they were all out of Taleggio at Tobey’s Gas and Groceries out on Rt. 3, so I substituted Parmesan. It worked just fine. Oh yes, Joshua suggests a Braeburn or Fuji apple. Obviously he did not learn much about Maine apples during his summer at Four Seasons Farm, otherwise I’m sure he would have recommended a Wealthy or Smokehouse. Several years ago John Paul and Emily gave me a copy of Deborah Madison’s cookbook, Vegetable Literacy, for my birthday. I’ve perused and used it many times for dinner inspiration, but it never occurred to me that a cookbook about vegetables would include a recipe for an apple tart. But Deborah snuck it into the chapter on buckwheat since it calls for buckwheat flour in the crust. It was a very thin chapter – only three recipes – so I guess she was willing to relax her standards a bit. I’ve made a lot of free-form tarts and included several recipes for them in the OOAL newsletter over the years, but what attracted me to this recipe was the fact that the apples are caramelized before baking which ensures that they will be cooked through and that it uses Chinese five-spice. I have two jars of it in my spice drawer, and have had little hope of reducing them down to a single jar in my lifetime. So HOORAY, I just used up 1½ teaspoons. Place the flours, salt, spice, and sugar in the bowl of a food processor, and pulse to blend. Scatter the butter pieces over the top of the flour, and pulse until the mixture forms small pebbles of butter. In a small bowl whisk together the egg yolk with the vanilla, vinegar and 2 TBS ice water. Dribble the liquid into the flour a little at a time. Process until the dough comes together. You can add more ice water one tsp at a time if the dough is too dry. Gather the dough into a ball. Flatten into a disc, wrap in wax paper, and refrigerate until needed. To caramelize the apples, melt the butter in a skillet over high heat. When the butter foams, add the apple slices. Sprinkle them with the sugar mixture. Initially the apples will give up some juice, but once this evaporates, they will begin to brown. Cook, tossing the apples frequently until they are golden and caramelized - about 10-15 minutes. Preheat the oven to 400 degrees F. Line a rimmed baking sheet with parchment paper. Heap the apples in the center of the dough leaving 2”of dough uncovered around the outside edge. Fold the edge of the dough up over the apples, pleating the dough as you go. Most of the apples will be uncovered. Brush the dough with melted butter. Pour any extra butter over the apples in the center. Bake about 30 minutes until the crust is browned and crisp. If you are not serving it right away, cover it and reheat before serving. Serve with sour cream, creme fraiche, yogurt or ice cream. I made one of these tarts using Summer Rambo and another using Smokehouse. They were very different, but we had trouble deciding which we liked best. The Smokehouse held its shape and texture better than the Rambo which got a bit saucy. But the spices had infused the soft Rambo apples and seemed to be the perfect comfort food to eat next to our first wood fire of the season. *Five Spice Powder is a blend of cinnamon, cloves, fennel, star anise, and Szechwan peppercorns. Some mixtures also contain ginger, nutmeg, and licorice.